Latisse® (bimatoprost ophthalmic solution 0.03%) is the first and only prescription eyelash treatment approved by the FDA for inadequate, sparse, or aging eyelashes. This eyelash lengthening product can thicken, lengthen, and darken your pre-existing lashes. 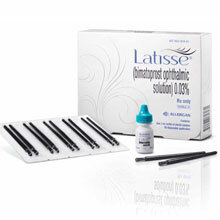 Latisse® works effectively over the course of 6-8 weeks and is applied once a day. Because it is a prescription eyelash product, a visit with a physician here at our New Haven plastic surgery center and medspa will determine if this is right for you. This is appropriate for women who have either naturally sparse lashes, or who have undergone chemotherapy.